Dorm wall art of London Phoneboxes make great dorm room decorations! They're unique and fun and also make your college dorm room a comfortable place to hang out and relax. When you think of comforting college dorm essentials, you probably don't think of college posters at all. You probably think of things like your dorm bedding and dorm furniture and you're not wrong at all - those are extremely comforting. However, don't underestimate dorm wall art for comforting dorm room decor pieces. Your college dorm room walls are going to be pretty bland and not comforting at all. In fact, they may detract from your dorm room decorations a bit which you don't want. Add fun, trendy style to those plain college dorm room walls with our London Phoneboxes Color Poster for Dorm Rooms! Our London Phoneboxes Color Poster isn't just an average phoneboxes dorm wall art item! 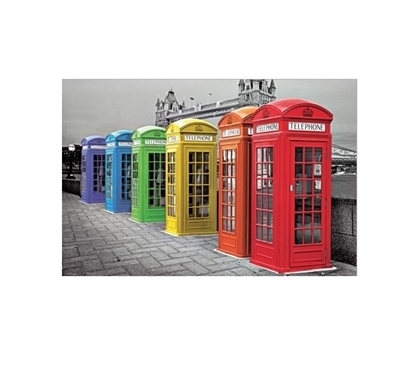 This college supplies item features plenty of London Phoneboxes in various colors lined up. The backdrop in this college poster is in grayscale, which makes the London Phoneboxes pop with color even more. This dorm necessities item will add some cool artwork to your dorm essentials, making your college dorm room stand out. Add cool design elements to your college dorm room walls and make your college dorm room feel like home by adding comforting college wall decor items like our London Phoneboxes Color College Poster to your dorm necessities!